Greetings from Nambul, the river that flows right through the soon – to – be – smart city of Imphal. 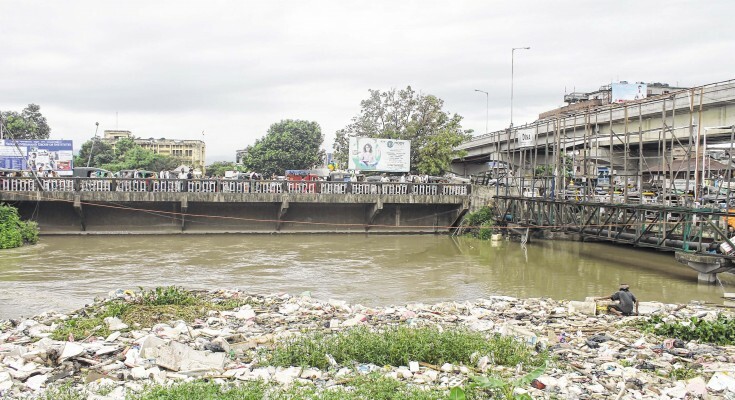 The river that has been projected as the 'Face' ( a face defaced by the State and the citizens alike) of the capital city of Manipur. This is a river that was once navigable and used as a waterway. A river on whose banks hundreds of thousands of children during schooling days spent their childhood swimming, playing all sorts of 'games', indigeneous and non – indigeneous. So clear was the water. So pollution free was the riverine eco - system. Not a single trace of plastic pollution was to be found /seen. The river that served as natural abode to many birds, rare, common and popular of wonderful colours. A variety of birds made this slow moving river their hunting ground, snatching small fish from the water. The sight of 'Ngarakpi' (Kingfisher) snatching and holding the fish in its dagger - like beak still lingers on and is as fresh as it was decades back. This is the same river that was home to plentiful varieties of fish - small, very small, medium and big - ranging from 'khajing', 'ngahou', 'nganaps', 'ngakijous', 'ngamu'(Meetei ngamu), 'ngamu sanghum', 'ngaroi', 'ngakra', 'ngasep', 'ngaril', 'ngaten', 'ngaton', 'ngasang', 'ngapemma', 'nunga', 'phabou- nga', to 'pengba - tharak', 'sareng', 'sarengkhoibi'. The river that was the small river of small fishes. The river that was the 'God of Small Things'. What had caused the shocking degradation that I am coerced to cope up with? What / who has poisoned my fresh water? What / who is responsible for reducing me into a den of garbage? What / who practically reduced this small beautiful river into a drainage? Whom do I blame for turning this river into a river of plastic? What / who on earth has destroyed my riverine ecosystem? What are the forces / who are the people who have drastically destroyed / scoofed my century - old basins? What / who took away all those playing fields that I provided for the children? the 'Borois', the 'Heinous', the 'Khongnangs', the 'Khongnangbots', the 'Koubilas', the 'Pungdons', the 'Manges', the 'Theibongs' - that I watered / nurtured to protect the soil erosion? Dear State, dear citizens, friends and fellow countrymen! This is one river, your river that hardly complains. This is so gentle and sober a river that rarely questions your actions and activities, which are detrimental to my survival. Did/ do I ever ask as to what happened to those Projects to clean, dredge, protect and save the river from pollution? Did / do I ever question as to where those 'crores' of rupees that has been pumped in gone? You knew / know it, why you, even a street dog knows it how the project money transformed a select small - time contractors / engineers; babus and petty politicians into crorepatis overnight. Project comes and goes. What remained / remains is the deteriorating health of the river. I know, for sure, you all are in no mood to have a glance, let alone go through, a cursory reading, this letter from Nambul. Needless to say, you are in full festive mood, all ready, all set to take part, to plunge in the 'biggest festival' that one could ever imagined in the largest democracy on earth (thousands of lakhs of you have already enjoyed / taken part though). So am I. So is this river. The Inner Manipur Parliamentary Seat for the 17th Lok Sabha Election goes to the polls on the 18th of this month. Questions / issues of state / national importance ranging from AFSPA to CAB to ILP to STDCM to 'Women's Bill' to ' Territorial Integrity' are flying high in the air, breathing down the necks of candidates. Election time is question time. Come elections, issues / questions would not be found wanting. Oh dear candidates, I could understand your aspirations / desire to get elected and represent 'Ima Manipur' in the House of People. There must be umpteenth number of things you wanted to do, promises to keep and make Ima Manipur peaceful, developed, a better place to live in, so to say. This river, your poor river, had been, all along, a disinterested observer of / on the performances (read lack of) of all the Manipuri MPs in Lok Sabha. They were / are, at best, conspicuous by their NON-PERFORMANCE activities and achievements towards the state's developmental path. This river, a victim of decades long 'politics of personal development', is yet to see / witness a single policy / project / scheme / initiated / implemented which could be considered as their legacy. All that the river has witnessed is how each one of them has built his / her own personal empire and fiefdom. These then, my dear candidates for the 17th Lok Sabha Elections, are the uniquely remarkable records of our MPs. Hold your breath, don't say it, that 'you are different and will be different'. That sounds contrite and repetitive, to say the least. I would love to believe you but past experiences and track records of our MPs made me feel cynical and sceptical of your words. Dear candidates, please consider this letter as AGENDA ENVIRONMENT, a post from the most polluted river in your state. Please go through, take serious note of and act on it, if and when you are elected to represent our 'Sanaleibak' in the House of People. Could you PROMISE as a Gentleman's word to the effect that You will, if ELECTED, contribute/ allot 2 crore rupees each year from your 5 crore per year of MPLAD Fund towards Saving Nambul / and other rivers?? Here is Nambul, your river, a dying river, wishing each one of you 'Good Luck' and the very best in your noble attempt to carry to New Delhi the voice of people. Please carry this combined message from Nambul, Loktak and Sangai to the floor of Lok Sabha and make all honourable members listen to it : " YOU CAN BUILD ANOTHER TAJMAHAL. BUT YOU CAN NEVER BRING BACK LOKTAK. YOU CAN NEVER BRING BACK SANGAI". * Rajendra Kshetri is Professor and Head, Department of Sociology, Manipur University, Imphal. Author of "The Emergence of Meetei Nationalism"; "District Councils in Manipur: Formation and Functioning"; "Sociology: Perceptions and Conceptions". Prof. Kshetri contributes occasional columns in the English edition of 'The Sangai Express'. His continuing series of poems on Nambul River " Cry of a Dying River", now in its 72nd lap, appears every Sunday in the Poetry section of Manipur's largest circulated English daily. This article was webcasted on April 15, 2019.